I know I’m not alone in feeling this way, but I hate hate hate hate hate hateeeeeee lock pick systems in RPGs. There are several problems with lock picking and locked chests in RPGs and I want to go over exactly why I feel this way. And to be clear, there is not a single game I have played that has a lock picking system I enjoyed. I hate them all. First there’s the random chance approach. Many CRPG’s go this route. Firstly, in these system, in order to even attempt to pick the lock you must have a certain level of skill. Already I hate the idea of sacrificing potential combat stat points for this type of skill which will be rarely useful. Second, it then rolls a chance for you to fail or succeed. From here, it can then go several ways, all of which I hate. It might allow you to keep attempting to pick the lock until you succeed, making the whole thing pointless. Second, if it doesn’t let you attempt again, it’s not only illogical (and what’s the point of realism with doing the actual lock picking in the first place) but it’s also easy to exploit via save scumming. You can just reload your save and try again. Developers know this, and they do it anyway. Next there is the “skill” based approach, most notable from Skyrim, where you must position and move the picks around and try to find the small windows where you can open the lock. Again, if you run out of picks you can save scum, and you can also try as many times as you want. So there is no challenge or point. 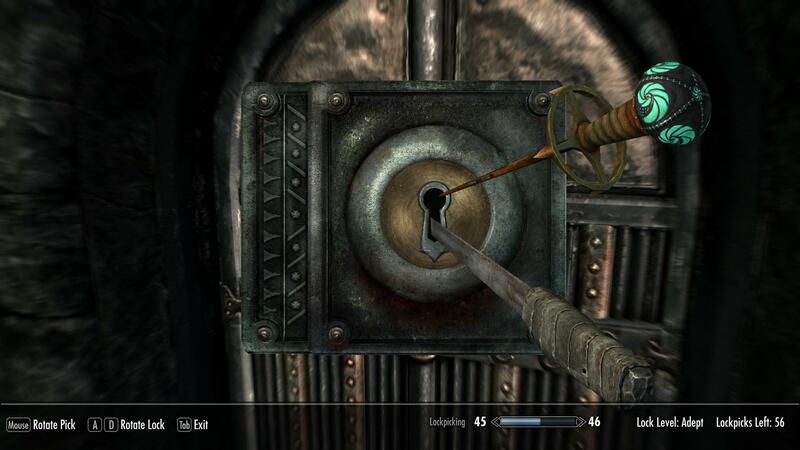 I have no shame admitting I used a lock pick hack to avoid lock picking in Skyrim and it made the game more enjoyable. In a game I started playing recently, Xenoblade Chronicles 2, you need to have the requisite skills to open the treasure. This makes me mad because it was often hard to find the treasure in the first place. Now I need to remember and come back when I have some random artibtary level of skill to open it. It’s terrible because I will forget, and if I don’t, by the time I actually did go back there (which I won’t) I would wager the gear was out of date at the time. It’s a tease, an annoyance, and one of the few things I dislike about the game. I think lock picking is one of things that seems like fun fantasy roleplaying, but is actually terrible when you actually have to do it. Sure, watching someone sneak into a building and quietly crack the safe and get out looks great in a movie. But in an RPG game where there is often no time or attempt limit pressure, this is an exercise in tedium. I am happy to report that in Grrbls there is a literal ton of treasure to find and collect. There may be times you have to make a tactical decision to avoid getting treasure (perhaps the danger is too high) but you will always be able to open treasure you actually get. I think its fun if you decide to take a risk, fight a tough monster and maybe win treasure (and risk death), than just fail at opening a treasure you already found. So ya, I have very specifically banished any lock picking mechanics from Grrbls. What about you, how do you feel about lock picking? Do you have games where you actually liked the mechanics?